Are you returning to work and thinking about childcare for your child? Are you a working mother who has had children in childcare for a little while? Either way, there is a good chance that you may be feeling guilty. Rest assured, you are not alone. 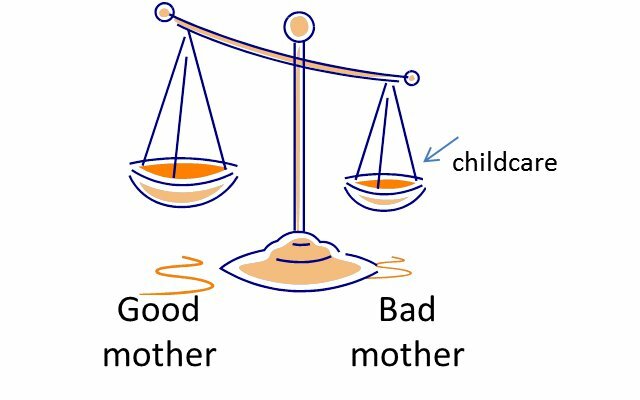 As if mothers don’t have enough guilt as it is, the childcare issue adds so much more weight to the “guilt” scales! My kids have been in childcare more or less full time from the time they were 12 months old. I should be a “pro” at this but over the 6 years that one of both have been in childcare, I’ve been on the pendulum – from feeling like an inadequate mother on one end to feeling like childcare has been the best thing for me and them. I have no regrets about having my children in childcare but still, the shadow of guilt hangs around. Sometimes it rears its head in conversation with other mothers, sometimes I feel it when I see how well other mothers handle having their children around all the time and I wonder whether mine would have been better off at home with me. But I know what kind of mother I am and what kind of children they are and I believe that childcare has helped me be the mother that I want to be. We have been very lucky with our childcare centre. The staff are wonderful, offering the kids a stable and caring environment. This has eased much of the guilt and we’ve even had some surprising moments that have challenged our beliefs. The first was when my first child went up to one of the carers and gave her a big whopping kiss. I was seriously taken aback. I was shocked, anxious, upset – basically jealous! My child had bonded with someone else. I managed to work through my turmoil. My place as “mum” hadn’t diminished. It was actually wonderful that my child felt such affection for her carer. I knew without a doubt that she was in good hands. It was just that I felt undermined. I wanted to be the most important person in her world and it helped when I realised that I still was. The second situation was experienced by my husband at pick-up time. Poor hubby thought he was doing our son a favour by picking him up early and hadn’t accounted for the possibility that he might actually enjoy being at crèche! And this wasn’t a one-off event. It has happened many times since. My elder child who is now in school still asks to go back to crèche during the holidays instead of attending the school holiday program. I have allowed her that luxury (luxury because it is an added cost!) but it’s getting to the stage now that she really is too old to be there. One of the carers has voiced her sadness that once our younger child is in school, she won’t be seeing our children anymore and I can understand how she feels. After all, she has been in their lives since they were babies. So it seems, that some of our guilt is misplaced. Self-inflicted. The energy could be better spent making the time that we do have together more pleasurable and memorable. This is what I now remind myself when I have an attack of the guilts. Why are you feeling guilty? If you are feeling any guilt over childcare, work out the source of your guilt. Is it because you feel you have no options? It is because you have super-mum syndrome? When you work out why, you will better be able to deal with it rather than continue sinking into the “guilt quicksand”. I have been a stay at home mum for 3 years and the last year I have been a work at home mum. I know that if I want my business to be a success they have to go into some form of childcare but I see it as a much needed investment as opposed to a cost to both finances and relationship. Thank you Lianne-carla for sharing your perspective! Oh so very true! While I know logically that child care is a fantastic place for my son and a much needed sanity break for me as well as allowing me to work, the guilt I feel every morning when saying goodbye to him is awful! Society has all these unwritten rules that say to be a good parent you must devote your entire life (and time) to your children but at the same time have some sort of work/life balance…. No wonder all us mums are confused! Those too things are impossible for me to do and therefore I always end up on the guilt train! I’m trying to overcome my emotional side with logic, but sometimes it’s very hard! The occasional cuppa in complete peace and quiet often reminds me why I’m doing this though! Good luck to all the mums out there that choose child care! I feel your pain! Hi Carley, I think society’s unwritten rules should be banished!! Difficult Staff – Is your high achiever one of them?